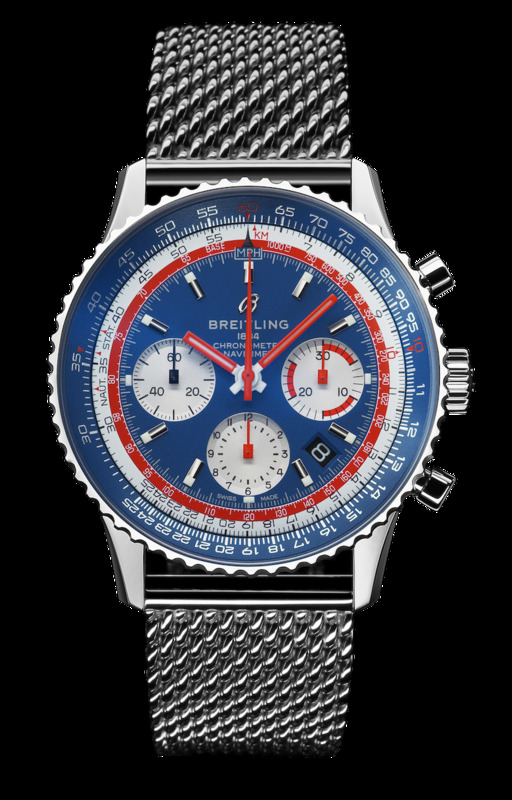 Breitling recently launched its first capsule collection the Navitimer 1 Airline Editions celebrating the brand's important role in the golden era of aviation and some of the most emblematic airlines of that time. The collection took off with Swissair, the former national airline of Breitling's home country. The second member of the collection honors a true American legend, Pan Am. Breitling's first capsule collection captures the spirit of a memorable time for commercial flight and revives the cool and evocative style of the 1960s and 1970s. The Navitimer 1 Airline Editions pay an affectionate tribute to the pioneers of civil aviation and celebrate some of the most emblematic airlines of the era. Switzerland's iconic Swissair has now been joined by Pan Am. Breitling CEO Georges Kern says: "We are introducing these Airline Editions in a new capsule collection that is produced for a limited time and consequently in a limited volume, but the watches are not numbered. With these capsule collections, Breitling aims to tell specific stories rooted in the history of its core collec- tion. This distinguishes them from our limited editions, which will retain their original intent: to be limited to a small, fixed number of watches." Breitling's Chief Marketing Officer Tim Sayler also highlights the storytelling aspect of the capsule col- lections, adding: "We are delighted that our first cap- sule collection underscores Breitling's important role in aviation in the mid- to late twentieth century truly the golden era of commercial flight. The watches also focus on the young, cool design styles of the 1960s and 1970s, which are particularly relevant right now and have a huge influence on current design trends." In the 1950s and 1960s, commercial aviation experi- enced an unprecedented boom. The world suddenly became smaller as the dream of flying was no longer limited to a privileged elite. Flying had become ac- cessible to a wider group of passengers, who, for the first time, could consider flying across a continent or even an ocean. 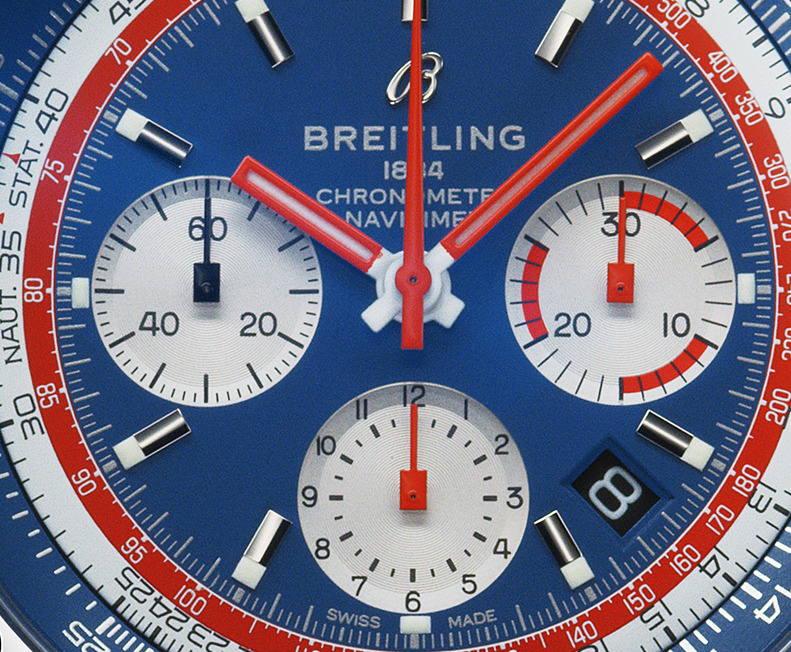 Breitling played a key role in the emer- gence of commercial flight. Its onboard chronographs became standard equipment, first in propeller-driven planes and later in the jets produced by the world's leading aircraft manufacturers. When the Breitling Navitimer wrist chronograph was launched in 1952, it became an instant favorite with aviators and notably with the dashing pilots of the late 1950s, who flew their iconic passenger aircraft, such as the Boeing 707 and the Douglas DC-8, across countries or on intercontinental flights. The Navitimer featured a circular slide rule that allowed the pilots to make any critical calculations they might need to make in the air. In these glory days of commercial aviation, the Navitimer chronographs were the original wrist- worn onboard computers and ultimately established Breitling already highly regarded for its onboard chronographs as the unrivaled official supplier to the world of aviation. Breitling CEO Georges Kern points out: "For civil aviation history lovers and watch aficionados, the very mention of these legendary carriers calls to mind the excite- ment and adventure associated with long-haul flights. For a more fashion-oriented clientele, there's the allure of the style of a time captured in classic movie scenes of passengers enjoying the premium service provided by smiling, colorfully uniformed crew mem- bers. 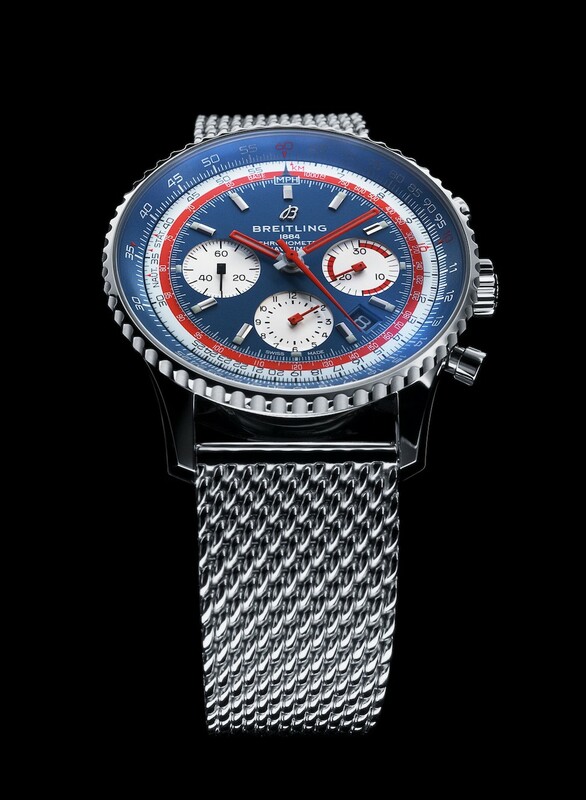 Breitling was the preferred supplier of more than 15 leading companies and aircraft manufacturers back in the 1960s, and, with our first capsule collec- tion, we are really excited about commemorating the most emblematic airlines of that era." The Navitimer 1 Airline Edition watches are powered by the Breitling Manufacture Caliber 01. The in-house me- chanical chronograph movement has been acclaimed as one of the world's finest and delivers both remark- able precision and a power reserve of approximately 70 hours. All models feature a bidirectional rotating bezel fitted with the famous circular slide rule, which serves to perform the entire range of calculations re- lating to airborne navigation. Their distinctive straight hands give the watches a dynamic, contemporary in- terpretation of a classic look. The case, in stainless steel, measures 43mm x 14.2mm. 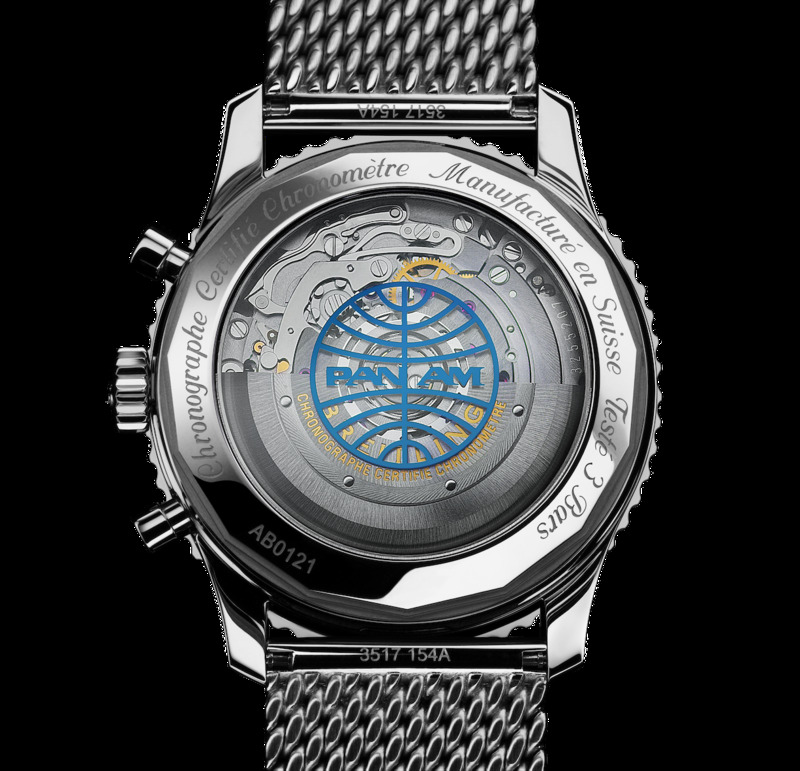 It has a domed AR-coated sapphire crystal, a sapphire display back printed with the Pan Am logo, and it is water resistant to 30 meters. Bidirectional rotating bezel with circular slide rule. Movement is the Swiss automatic Breitling in-house caliber 01 with 47 jewels, 28,800 vph and a power reserve of 70 hours. Chronograph: ratchet wheel control, vertical coupling, 30-minute and 12-hour counters. Display: hour, minute, second, window date. It is COSC-certified as a chronometer. It has a blue dial with SuperLuminova hour markers and hour and minute hands. Silver sub-dials. It comes on a vintage brown leather strap with a steel pin buckle, or a Breitling Air Racer bracelet with folding clasp, or a stainless-steel mesh bracelet with folding clasp. I'm anxious to see some real life pictures once these start hitting the stores. I think the blue dial will really pop. I'd love to see it on the traditional Navi bracelet.